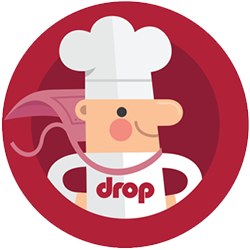 A Drop recipe is divided into four sections, or tabs: About, Prepare, Make, and Discuss. Here, you also have the option to save the recipe for later by tapping the bookmark icon in the top right corner of the recipe&apos;s hero image. The Prepare tab, as the name indicates, is where you start preparing for actually making the recipe. 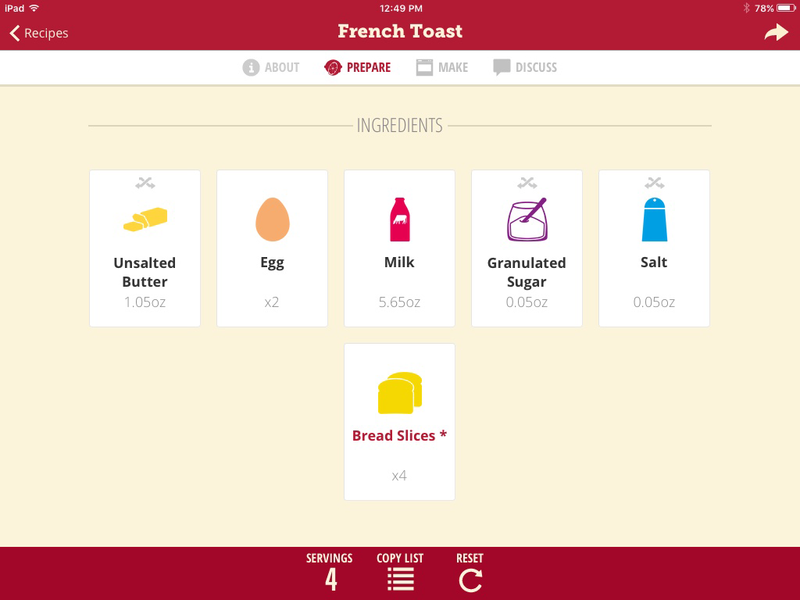 It&apos;s here you have the option to manually adjust servings, scale the recipe by scarce ingredient, or copy the shopping list. 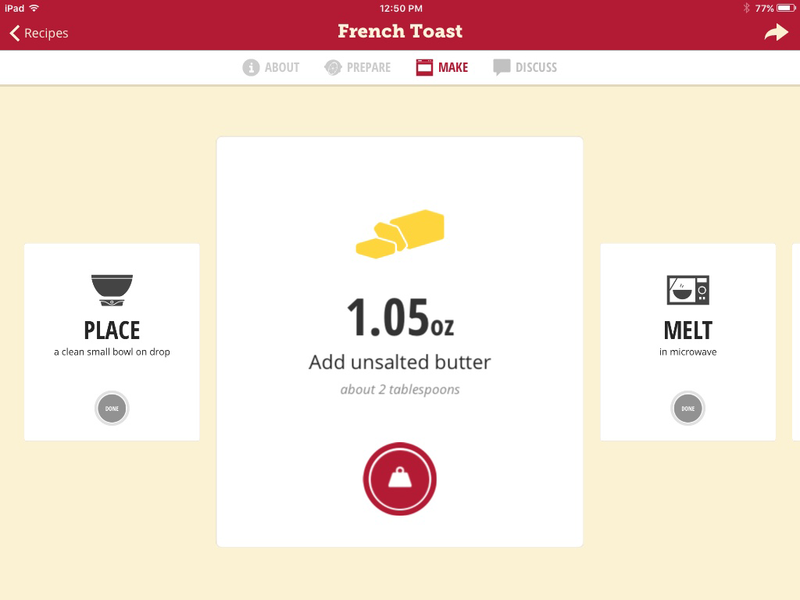 It also gives you lists of all the ingredients and tools needed for the recipe. Want to substitute an ingredient you are out of for something else? Read all about it here. Have you always been wondering what the asterisk means? Here&apos;s the answer. In the list of tools needed, you will sometimes see items like stand mixer, rolling pin, or cookie cutter. 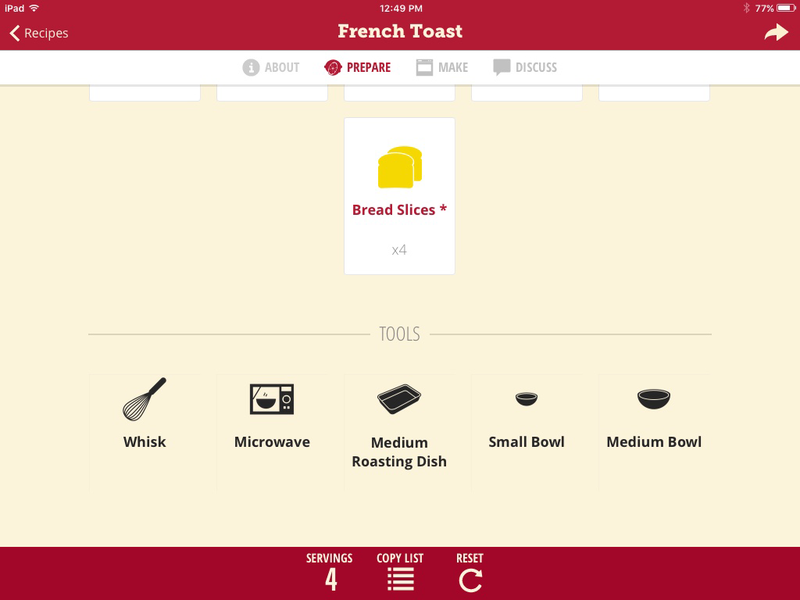 Often, the tools aren&apos;t crucial to be able to complete the recipe — they just makes it easier. If you notice a tool that you don&apos;t have at home, don&apos;t let that stop you as there are many ways to use makeshift alternatives instead. When you are ready making all the adjustments necessary in the Prepare tab, move on to the Make tab to start making the recipe. Our recipe format is based on simple step-by-step actions, just start from the beginning and complete the tasks one at a time. Tap the Done button or, if you own Drop Scale, the front button of the scale to progress to the next step. For weighing steps, you can also go to the app Settings and choose Auto-Progress if you want the app to automatically move to the next step when the target weight has been reached. Some steps have a Weigh icon which, when tapped, will open a weigh modal. 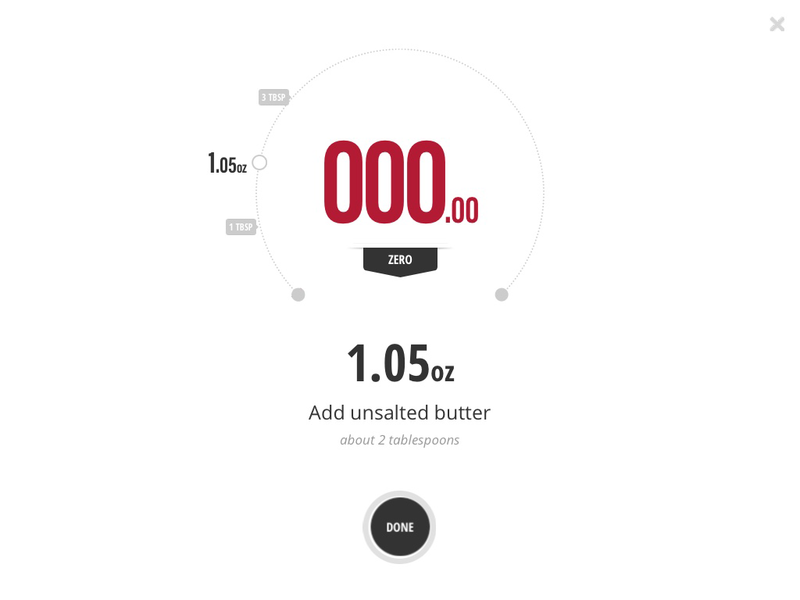 With Drop Scale connected, add the ingredient slowly until it hits the target weight, then tap Done. You will notice that most step cards also show approximate volume targets (cups, tablespoons, etc.) for each ingredient. These estimations are only rough estimates and a Drop recipe should never be made based on these. On many ingredient cards, you will find a red tab in the bottom right corner. Tap this and you will find a helpful tip for this particular step. We encourage all recipe authors to add as many tips as possible as it makes the recipe easier to follow and empowers less-experienced cooks and bakers. 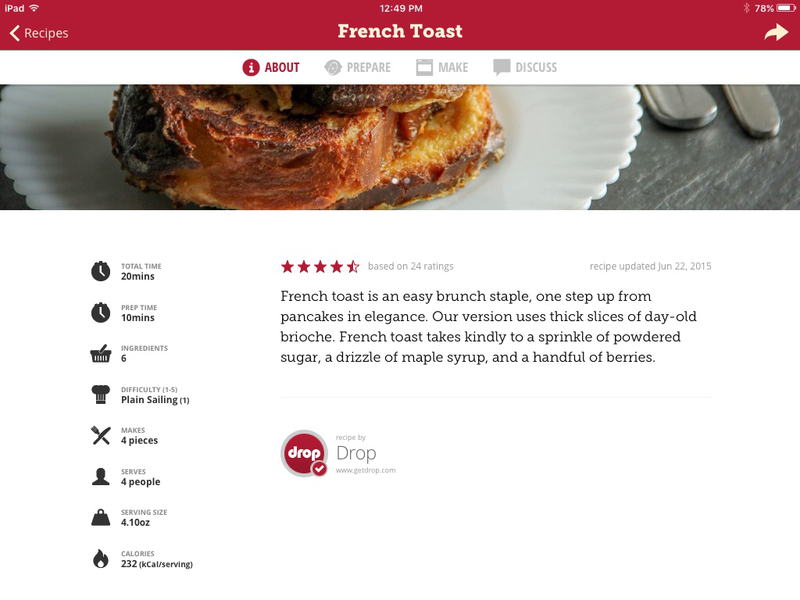 When you are finished with a recipe, you will see a screen which allows you to review the recipe, take a photo of your finished creation, or share the recipe with friends and family — we encourage you to do all of these things! Do you have a general question about a recipe? Wonder what type or brand of an ingredient the recipe author suggests? Curious about a specific technique? This is the place for you. 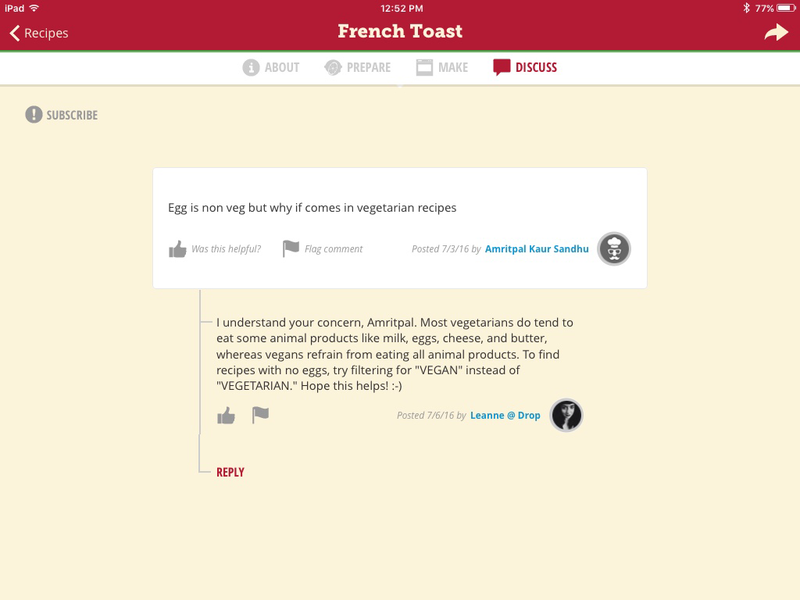 Write your comment and the recipe author, and anyone else following the discussion for this recipe, will be notified through a push notification, making it easy for them to jump in. Before you comment, please make sure that you have read our Community Guidelines.